Hardcover, 9 x 11.25 in. / 128 pgs / illustrated throughout. Text by Lynne Cooke, Enrique Vila-Matas. 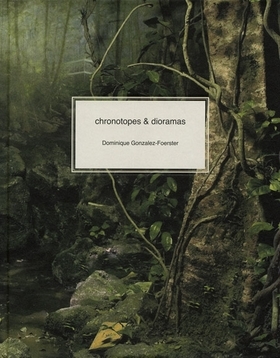 Chronotopes & Dioramas explores key themes developed in Dominique Gonzalez-Foerster's site-specific 2009–2010 installation at Dia at the Hispanic Society of America. For this project, Gonzalez-Foerster took as her point of departure the Society's renowned research library, expanding and updating the historic collection with twentieth-century literature by nearly 40 different authors. The artist installed these books in a trio of dioramas, organizing them by place of origin in one of three regions: the desert, the tropics and the North Atlantic. This companion volume to the installation includes new writing by Gonzalez-Foerster's past collaborator, the celbrated Spanish novelist Enrique Vila-Matas. The book is printed in three different covers, reproducing each of the three diaromas. FORMAT: Hbk, 9 x 11.25 in. / 128 pgs / illustrated throughout.